For over 14 years, family-owned and operated Kemp Hearing Centres has been serving the Winnipeg area and delivering exceptional hearing health care to their clients. The only hearing centre in Manitoba to receive the BBB® Torch Award for Marketplace Ethics and Integrity. Electra Sign worked with Jason Kemp and his team to ensure their image would respond to their specialized markets. Providing signage to both of their state-of-the-art hearing clinics in the St. James and Linden Woods communities, Kemp Hearing Centres continues to stand above all others in customer appreciation, product quality and personalized service. Kemp Hearing Centres is proudly Independent, Family owned business dedicated to helping those suffering from hearing loss. Two locations: 871 Waverley and 3393 Portage. Winnipeg Children’s Museum: Electra Sign Ltd. | Syverson Monteyne Architecture. “Have you encountered the term Environmental Graphic Design? Does it mean using nature or environment in creating designs? If you’re someone who’ve been to a site within a built environment (e.g. museum, zoo, retail store, hospital, corporation), then probably you have stumbled upon EGD. Founded in 1984, Bluenotes has been one of Canada’s leading denim retailers for over 30 years. 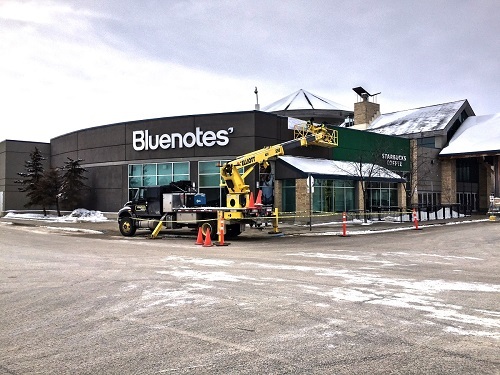 Electra Sign was pleased to work with Bluenotes in creating their recent exterior branding package at St. Vital Shopping Centre, Winnipeg. The signs feature Eco-friendly LED illumination which provides a brightly lit, impactful punch that is incredibly energy efficient. Product Philosophy: Bluenotes’ distinct brand of retailing focuses on denim as the standard, as well as hoodies, graphic tees, polos, tanks, and other wardrobe must-haves. Bluenotes strives to provide their customers with un-paralleled quality and value. Bluenotes currently operates 125 stores in Canada. The online store www.blnts.com has recently crossed over the border and launched US shipping in November ’09. Community Involvement: Since 1997 Bluenotes has been a proud and major sponsor for Kids Help Phone, raising more than $1.3 million throughout its years of involvement. Drop by their spacious retail location at 1225 St. Mary’s Rd. Winnipeg, MB. or visit them online.